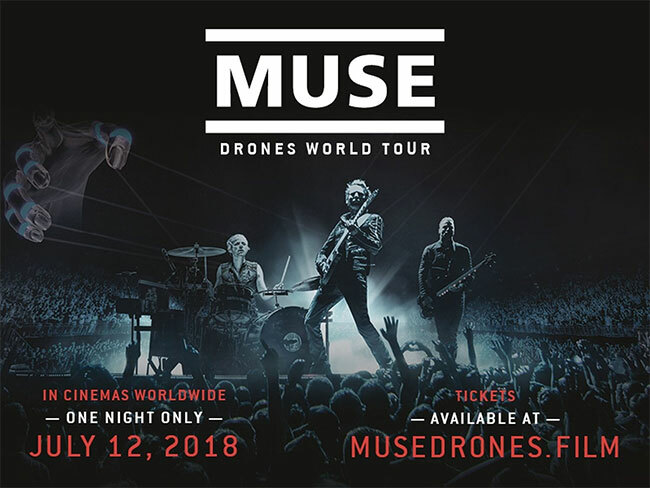 Muse will be releasing their ambitious Drones World Tour to cinemas worldwide this Thursday (July 12) for one night only, through Trafalgar Releasing. Exclusive screenings will bring the globally renowned, multi-platinum-selling band and their Drones in the round spectacular to the big screen. Filmed and recorded over multiple tour dates in 2016, the Drones World Tour worldwide release, distributed by Trafalgar Releasing will showcase Muse’s career-spanning hits including “Psycho,” “Madness,” “Uprising,” “Plug in Baby,” “Supermassive Black Hole” and “Knights of Cydonia,” amongst others. The film contains never-before-seen special effects which perfectly compliment the creative stage production, ensuring the ultimate audio/visual sensory experience. Central to the tour’s visuals were the drones, which flew autonomously above the stage and across the audience, alongside giant projections which interacted with the band members on stage. This spectacle features LEDs and lasers that perfectly compliment the band’s celebrated repertoire. “The Drones show reflects the mood and story of the album, we played for the first time in the round, and wanted a show that was stark and spectacular featuring cutting edge autonomous drone technology,” states the band’s Matt Bellamy. Fans can visit musedrones.film to see where the film is playing in their area.